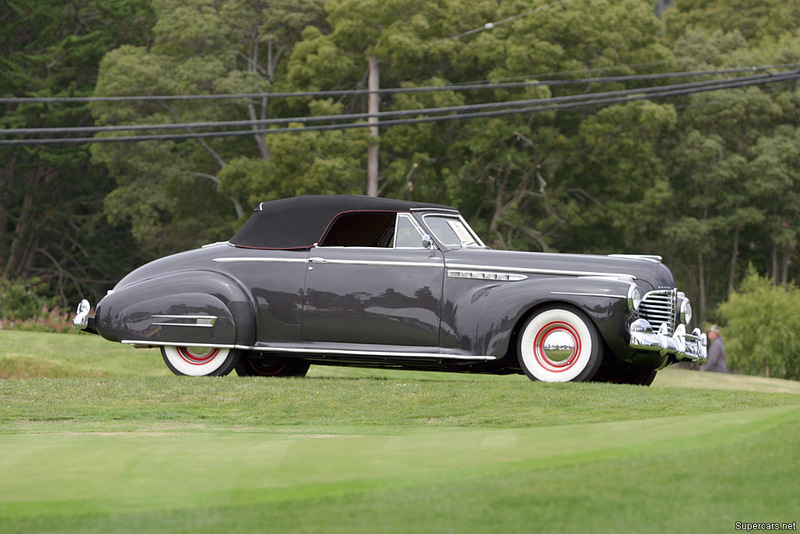 Compared to the 1940 Buicks, the 1941 models had a smoother, sleeker look while remaining unmistakably Buick in style. A newly designed engine called the “Fireball” eight debuted complete with a new induction system called “Compound Carburetion.” This was a dual-carburetor setup with just the first carburetor working at slow speed and idle. During rapid acceleration or at higher speeds, the second carburetor would engage for more fuel flow. Together with other factory changes, this meant that the horsepower of both the Roadmaster and Limited was 165 – 15 hp more than Cadillac’s V-8, much to the chagrin of Cadillac’s top management. 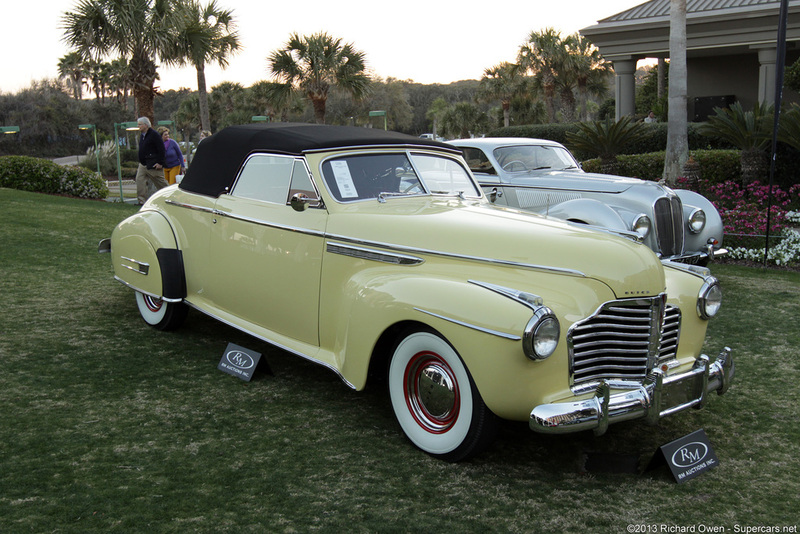 Certainly the levels of workmanship, materials and style in the senior 1941 Buicks were the equal of their costlier divisional rival, Cadillac, as well as competitors like Packard and Lincoln. This stunning Roadmaster Convertible Coupe is painted Sequoia Cream over red leather, the attention-grabbing combination so prominently used in Buick advertising of the era. The black canvas convertible top is accented with red welting and is power-operated. Full rear wheel-skirts accent the sleek lines of the rear fenders. Wide whitewall tires are mounted on red rims, further highlighting the dynamic color scheme. Benefiting from a no-expense-spared, ground-up restoration by one of the nation’s top Buick authorities, Doug Seybold, in 2011, no detail has been overlooked in this virtually flawless Buick. The red leather interior is upholstered in hides purchased from Plumber Leather in Cleveland, Ohio, the company that supplied the original upholstery in 1941. The chassis and under-hood are detailed to perfection. Inside one finds a radio, clock, heater, defroster, and turn signals, as well as the characteristic engine-turned dash used on Buicks of the era. Even the trunk lining has been re-manufactured to duplicate the original. 1941 Buick Model 76C Roadmaster Convertible Coupe – sold for $126,500 No-expense-spared restoration to exacting standards by marque expert Doug Seybold. One of only 1,845 Convertible Coupes produced for 1941. Multiple award winner including AACA First Junior in 2009, AACA Senior in 2010 and a 1st Place and Senior Gold Awards at the Buick Nationals in 2011.